• to participate in civic and community affairs so as to ensure the enduring respect of the legal system. 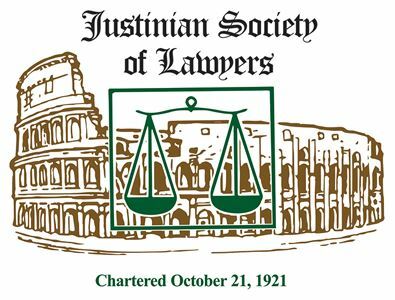 Since the founding of the Justinian Society of Lawyers in 1921, this venerable institution has become one of the largest ethnic bar associations in the United States. Our members are among the most active and influential in the legal profession. The society takes great pride in its contributions to the practice of law and to the administration of the justice system. Like any successful organization, The Justinian Society is dependent on the involvement of its members. Perhaps it is the commonality of Italian heritage or the fellowship of professionals; it is nonetheless gratifying to observe the consistently high level of participation of our members. For these reasons, the society continues to grow as a dynamic force in the legal community while retaining a special place in the heart of each member.